Spring is here! We are working on slowly coming out of hibernation and getting back into the swing of our outdoor lives. Whether you are a hiker, camper, swimmer or even just playing pokemon go on a summer’s night type, we are beginning to see ourselves reconnecting with nature in ways we couldn’t this winter. We have evolved and see ourselves wanting to pursue new things, let this transitional time be your time to find new experiences and grow into new habits. On your mat, I invite you to scan your body while practicing, do you notice a pose is “easy” and you could find some extra growth in going a little deeper? Do you find yourself doing the same postures and find room to try something that may have seemed scary before? Crave a new pose but find a healthy limit to challenging yourself. Off your mat, I invite you to make a list of all the experiences you’ve wanted to try but haven’t taken the action to do quite yet. Find a realistic first step to achieving this experience and work toward one step at a time, a healthy step at a time. Don’t let the what if’s win, and never hold yourself back because of them. Forgiveness is probably one of the hardest things we can do. When we become hurt, we blame ourselves and struggle to find a place of growth. The sayings go “forgive but don’t forget. '“ and “forgive them for yourself.” But we don’t think about the intention behind the healing component of that need to forgive those who have wronged us in our past and forgive ourselves for letting ourselves be hurt. It’s the intention to heal that matters most. Off your mat this week, I invite you to make a list of all the people you want to forgive for the things they have done to hurt you. After your list is compiled write down a sentence forgiving each person. This week is the full moon and I invite you to burn each sentence in a fire, whether it’s a fireplace, a fire pit or in a candle, as each sentence of forgiveness burns away, let go of the hurt and allow yourself to move towards healing. This same idea can move onto your mat as well. As we practice, practice strength poses. This strength building will give you what you need to move forward. A combination of breath and strength postures will be the tool you need to release the hurt and allow the healing to commence. Do you ever find yourself going and going all day and before you know it, you look up and the clock says it’s 10 hours later and the sun is starting to set? This is an example of how we overwork ourselves and find ourselves in this wormhole of stress and mindless working. We aren’t slowing down enough to have intention behind our work. Learning to be in the present and aware of the world around us while still working towards a goal of accomplishing a task. This is where this week mantra comes into play. Off your mat, I invite you to set an alarm every hour, when the alarm goes off, stop whatever it is you are doing, close your eyes and take 3 deep breathes to recenter and become present in the moment. Doing this for one day will help you recognize how these small moments of meditation can help slow your mind, reduce stress and become present with the task at hand. On your mat, focus on a practice around the breath. Use pranayama and closing your eyes in your practice to look inward. Try to slow your mind and let the thoughts that don’t serve you on your mat to release from your body on the exhales. Try to not let ideas of what you need to do next invade your space while you are doing something for yourself. Most importantly, take that time for yourself. This highlighted pose for this month is less prop intensive and challenge pose like and more of a foundation needed to help you find your sitz bones to have optimal range of motion in any seated poses. For staff pose, the props you will need will be an extra long strap or two straps, or as many ties as needed to for this length and a block. Make as large of a loop as you can to be about the length of your legs. Place the block under your feet and wrap the strap around the back of your pelvis and and the back side of the block. You want this to be tight enough where it shifts your weight forward where your spine is aligned straight. The block under your feet forces you to flex your feet to help protect your knees from locking out and causing problems there. Activate your Uddiyana Bandha (core) to help give you strength in this posture. Hang out here in this support for a few breathes and observe the feeling your body has. Notice the effortless effort it provides you when you are stacked straight. Then try this posture again without the support and see if you can bring yourself up on your sitz bones to get the same feeling. I don’t know about y’all but I have been seeing everyone around me, low energy and ready for a break from this weather, maybe from school or work and definitely from the miscommunications around us in this time of retrograde. As we feel ourselves become irritated by the negative energy surrounding up, it can be easy to allow negative energy to cling to our low vibrating energy bodies. This week I invite you to create a bubble of protection around yourself. Off your mat, wake up in the morning with intention. Ask yourself, how can I have a good day today? Then set the intention in mind to make it happen. Close your eyes, take a few deep breathes and in your mind, imagine creating a bubble around that intention and don’t let any negative penetrate that intention throughout your day. If you struggle imagining a bubble, take your hands over head and with your arms, create this shield. On the exhale, sweep your arms down and see the energy bubble be created before your eyes. On your mat, allow yourself to recharge this energy, maybe do some spinal movements, to wake up that chakra energy flow, maybe close your eyes and look inward to your light, and most importantly, never let it burn out from the energy around you. Good morning, KYD! Let’s start your weekend off on a groovy foot. This playlist features a lot of Dallas native and QUEEN of R&B: Erykah Badu. Being a spiritual woman herself, it only feels right to have her voice serenading my yoga classes. Also featured in this playlist are Masego, FKJ, Robert Glasper, Syd, Sampha, and Jhene Aiko. Enjoy! I have been practicing with Karma Yoga for about 5 years, and completed my 200hr Teacher Training at Inspire Yoga Denton in 2017! I am currently a senior at UNT and will graduate in May with a BS in Kinesiology and a minor in Health Promotion. The yoga classes I lead are mostly slow flow and always beginner friendly. I love music— I make the playlists I use in class for a relaxed flow and post them on our blog for everyone. Many of us yogis practice our asana practice regularly, but did you know there are more layers to what yoga is than just the physical practice? I recently started a book club for yogis to get together and read about the ethics of yoga and how to apply these practices off our mats, allowing us to live yoga as a lifestyle. The book we most recently finished was The Yamas and Niyamas Exploring Yoga’s Ethical Practice: by Deborah Adele. Some of these limbs may seem confusing since most of us have experience with only the first 3-5. I personally struggled with understanding the last 3 for I have not reached that point in my practice to understand them. The limbs are building blocks. We need to grasp the first one, before moving on to the second and so on. The first two limbs are ways we can better ourselves with how we interact with others and ourselves in our everyday life. This book covers the first two. These are practices we need to have off our mat before we even attempt to step into the asana practice. Whether you practice yoga or not, Adele does a great job at breaking down these principles in a way that a modern day person can incorporate. Since these are ways to interact with those around you, you don’t need to be a yogi to hold these ethics or morality in how you interact with your fellow humans. She takes each word and breaks them down into the different ways to apply them within ourselves, with other humans, and within our environment. This portion of the book is where you can either learn a lot about yourself or over analyze yourself fast. It lays out self-reflection in a way that allows for you to become in touch. I found myself having to stop and take breathers because some aspects hit a little close to home where I could better myself. The thing I enjoyed the most about this book was at the end of each chapter, it gives you a month long exercise of things you can do to practice each week to incorporate that principle into your everyday life. My favorite exercise was for Saucha and it was to take an hour to eat an orange so you can start to pay full attention to the things we do and slow down our eating habits. Adele has a way with words that allows me to pull some awesome quotes to use in yoga classes and personal mantras when I need them most. This book is also a quick and easy read and is a good book to reference when in need of a pick me up. My only issue with the book surrounds around the idea of the use of god as a fixed term. In yoga, we use the terms the divine, god, the universe, spirit and many others to express a freedom of interpretation to the unique individuals experience. I wish I would have seen more of this broader term used throughout the book. I have found myself incorporating this book into my everyday life as a teacher, as a student, and as a person in general. 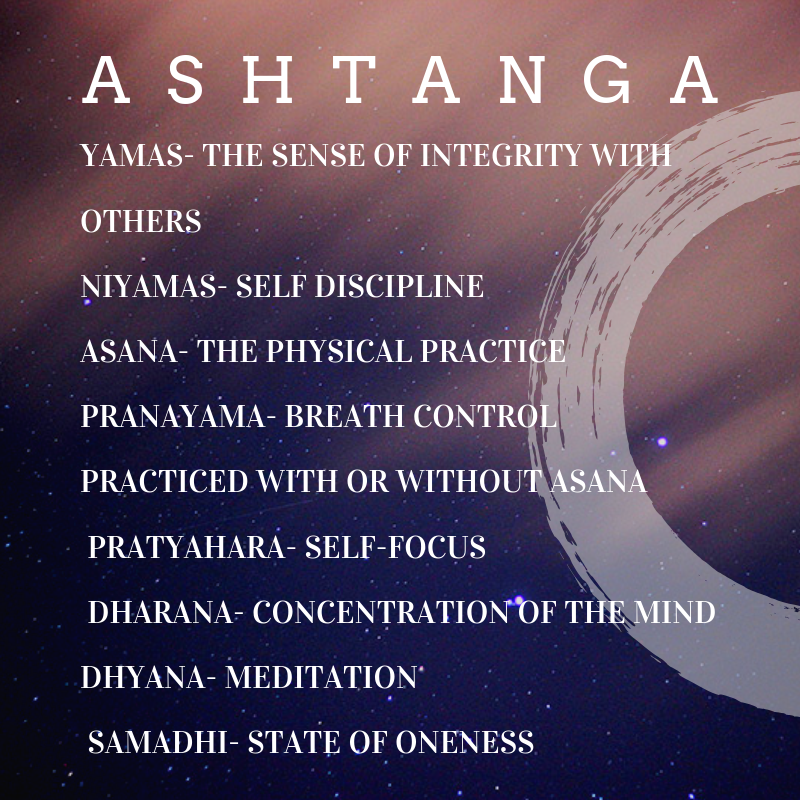 As a yoga teacher, I take these principles and utilize them to teach my students something on their mats that they can also take off their mats. As a student, I allow it to be an act of humbling and connection with myself and my fellow yogis on the mats next to me. Lastly, as a person, this book has allowed me to find a healthy connection with things around me and realize, my truth is not the full truth. As “The Buddhists say that the universe dies when you do because you have created your own little world of reality. “ (Adele 151). Lastly, for anyone interested in getting involved with a group of fellow yogis to read more about yoga ethics and how they apply to a modern day yogi. We meet every other Wednesday at 7:30pm at Harvest House. For March 6th, we will be reading the introduction and first chapter to Do Your Om Thing by Rebecca Pacheco.